The need for rubbish removal is always present when we end up collecting piles of items we simply don’t need any more. Sure, it may be a small room filled with items from our childhood that get in the way or maybe pieces of furniture we want to replace, but most of these jobs end up with items we can’t simply throw away. This is where we come in, taking care of your Dartford rubbish clearance for you, so you don’t have to. 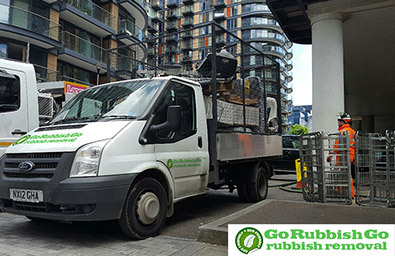 Go Rubbish Go has services covering the DA1 and DA2 areas, allowing you to count on our services anytime you need professionalism and speed, all without the hindrance of getting a skip permit. With our DA1 waste clearance help you will never have to worry about your rubbish again. Our waste collection in Dartford, DA2 will help you get your green waste under control as well as any other kind of waste you may be dealing with in the process. You will be left with a nice and clean space you can enjoy. We are fully aware that moving of heavy pieces of furniture or appliances is tiresome, but also dangerous, so we train our staff to complete the job to the highest standard. They will get things done for you and you won’t have to worry about a thing. No matter what you’re looking for in Dartford DA1, we have you covered. From waste disposal to getting rid of the random old possessions you have around your home we can deal with it all. Call 020 8610 9182 now for a free quote and a rubbish removal in Dartford you can rely on. What Makes Our Rubbish Removal in Dartford The Best Choice? We have experience, we have the manpower and vehicles to meet your needs and we have the professional attitude needed to keep things flowing fast and efficient. If your garden is in urgent and serious need of a good clear-out, then we will answer your needs with a swift and affordable Dartford junk removal service you can count on. 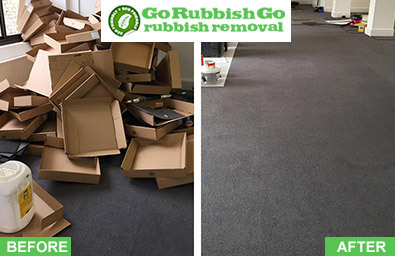 Go Rubbish Go helps businesses and individuals alike, no matter how hard the job may look at first. Book an appointment with us today and you will see your clutter and rubbish gone in a few short hours at most, letting us take care of the smaller details all the way without you ever having to lift a finger. I needed help with rubbish removal in Dartford. My basement area was full of clutter due to years of collecting junk in my home. They came on time and their work was quick and affordable. They said that they would send my stuff for recycling in the nearest recycling depot in DA1. Thanks again! We have an extensive selection of services you can choose from. We will take care of any of the items you need gone away from your home. 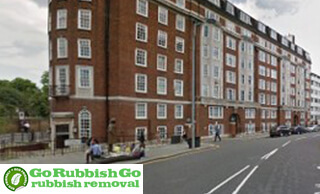 You can book an appointment with our trained and experienced team of rubbish collectors now. Get rid of the rubbish you have around and end up with a pretty clutter-free home in no time at all. Our waste collection Dartford team will dispose of your junk in a completely safe and affordable way. We work hard to provide professional services all around the Dartford, DA2 at low prices. Our team count on proper teamwork to provide you with a great service that is unbeaten around the area. Just call us on 020 8610 9182 and we’ll be there for you for your waste removal. Our rubbish disposal team will be there to provide you with a waste clearance solution in that simply cannot be beaten in terms of speed and professionalism. For a nice and low price we will be there for you to meet your needs. We will be there to cover you all the way, keeping rubbish disposal under control and allowing you to go about your day without having to worry about anything in the process. We aim to recycle and reuse as much of your items as possible, so you will not have to worry about the environmental impact of your waste disposal DA1. At the end of the day you will have what you need and your waste removal will be a breeze all the way. Give us a call today at 020 8610 9182 to find out more. Dartford is a town in Kent and the principal town of the borough of Dartford, located on the border between Greater London and Kent. It lies in the centre of a beautiful valley where the River Darent flows right through and where the old crossing from London to Dover used to be, leading to its name (Darentford, later changed to Dartford). What was once a market town during the medieval age now stands as a commuter town for the Greater London area with its own rich history. It has its own railway station – Dartford railway station as well as the Fastrack buses connecting the Kent Thameside areas. Dartford is also home to the Orchard Theatre and the Mick Jagger Centre, both providing ample opportunities for arts and culture.